Sent to Earth by Optimus Prime ahead of the other Autobots, this tough robot's job is to do what he does best: gather information, find the keeper of the secrets of the AllSpark and remain hidden. Bumblebee works best in silence and solitude, acting as an unseen guardian over his assigned target. Don't let the fact that he likes to remain hidden fool you, though - when it comes to a fight, he rushes in, both plasma cannons blazing. 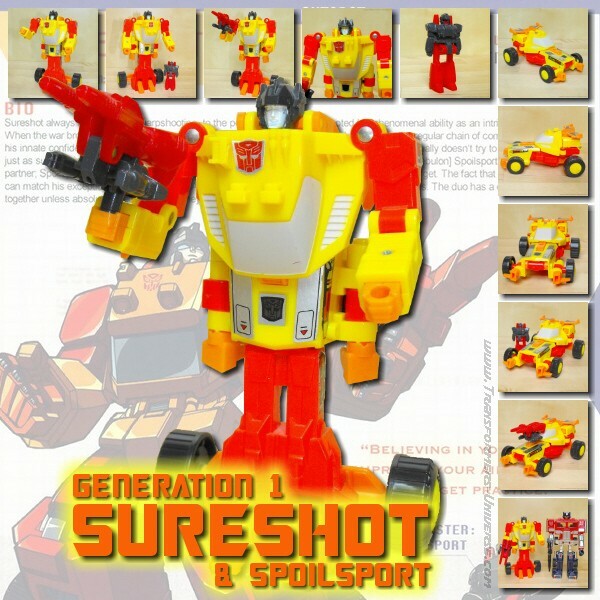 Robot Mode: How much does Movie Bumblebee resemble G1 Bumblebee? Not much. That said, Movie Bumblebee is a great-looking figure. His huge feet take a moment to get used to, but once you are you recognise that they do wonders for his stability and enable you to put him into all sorts of great poses. His posability, btw, is excellent. Detailing could be a bit better, but that's just a minor thing. Bumblebee comes armed with two missile launchers he can either hold in his hands or mount on his shoulder wheels (the latter looks better IMO). Bottom line, a nice looking Bumblebee that looks ready and willing to take up the battle for the AllSpark Cube. Vehicle Mode: While I'm still sad that he's not a Volkswagen Beetle, Bumblebee does a fine job appearing as a '77 Camaro. The car mode is a bit plain-looking, some more details would have been good, but that's pretty much my only complaint. Many of the previous Transformers series were pretty gimmick-ladden, so it might come as a surprise that car-mode Bumblebee has none (okay, you can put his guns on his rear wheels, but that's it), but remember: Originally, transforming into a car WAS the gimmick. So he's fine by me. Remarks: The Movie toyline features many different versions of Bumblebee, one of the main characters of the film, but in my opinion the Deluxe version once again takes the throne. While this toy is not as detailed and feature-ladden as Ultimate Bumblebee, his scale makes him compatible with the other figures and his posability is actually better due to less constraints. Okay, the resemblance to his movie incarnation could be a bit better, but that holds true for quite a few of the figures, simply due to the fact that the CGI Transformers in the movie are a lot more detailed than any toy could ever hope to be. So to sum it up, this is a great Bumblebee figure. If you buy just one Bumblebee from the Movie line, then I'd recommend this one.